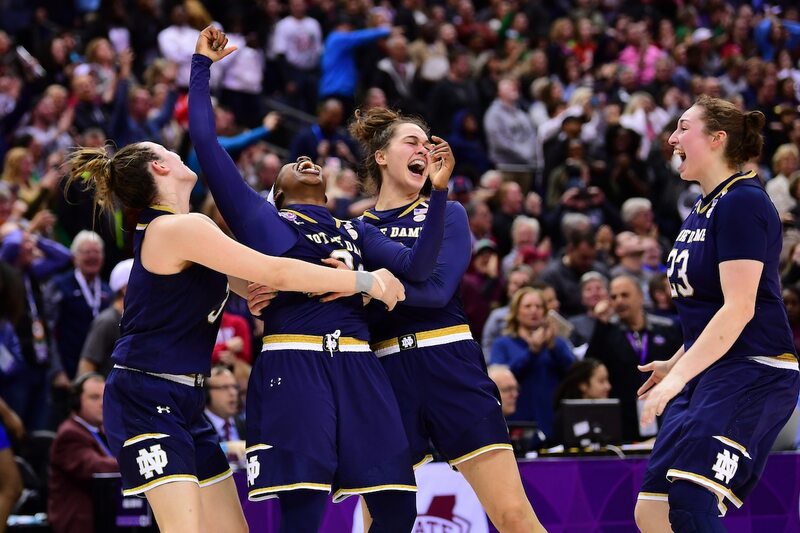 CHARLOTTE, N.C. — Notre Dame is defending a different kind of women's basketball championship. For the first time in a long while, Louisville has to defend one, too. Notre Dame returns four starters from the team that won the program's second NCAA Tournament and first since 2001. But for the first time since their first season in the ACC, the Fighting Irish aren't the defending league tournament champions. Asked Tuesday about the plusses and minuses of having to follow up such a run, Louisville coach Jeff Walz quipped that "I don't see many minuses." "We're a year older, a year more mature," he said. All eyes this season will be on Notre Dame guard Arike Ogunbowale, whose last-second shots first lifted the Irish past Connecticut at the Final Four and then past Mississippi State in the title game. Those heroics earned her a spot on ABC's "Dancing with the Stars." "I felt like I was living with a celebrity," teammate Marina Mabrey said. But she couldn't beat the Cardinals in two tries last year. Louisville took care of Notre Dame by 33 points in the regular season, a result that helped it earn the top seed in last year's ACC Tournament, and then beat it again in the title game in Greensboro. The Cardinals also reached last year's Final Four before falling to the Mississippi State team that Ogunbowale stunned two nights later. "Having the opportunity to win your regular-season and conference titles, especially in the ACC, it's gratifying for sure," Walz said. "It's something to be very proud of, and it's difficult as we all know, and we're looking forward to the challenge again this season." "My role for this year hasn't changed as much," Durr said. "I'm still the same player, but I'm more vocal."